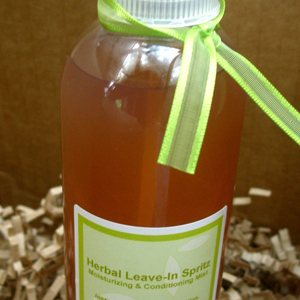 Give your coils and waves an instant boost of moisture with our natural Herbal Tea Leave-In Conditioning Spritz!!! Use this throughout the week to revive & refresh your curls. This is an EXCELLENT moisturizer, conditioner and refresher for locs, twists, braids, curls and waves! We start by infusing a lot of organic herbs known to promote healthy hair growth along with more natural ingredients to provide much needed moisture, softness, conditioning, and detangling properties. Spritz directly onto wet or dry locs, waves, twists, braids, or coils for instant moisture boost & to refresh your hair & scalp. ingredients: aqueous infusion of distilled water, aloe barbadensis leaf juice, organic nettle, organic peppermint, organic burdock root, organic horsetail, organic marshmallow root, organic coltsfoot, organic sage, organic hibiscus, organic sea kelp, organica sea moss, vegetable glycerin, sea salt, tangerine essential oil, peppermint essential oil, tea tree essential oil, phenoxyethanol, caprylyl glycol. Spritz directly onto wet or dry locs, waves, twists, braids, or coils for instant moisture boost. *Use to gently soften and detangle. *Use it as a daily or weekly leave-in to naturally condition dry curls & waves. *Use to condition locs, twists & braids.